Equip your tractor with . . . Turn your tractor into a real workhorse with one or more of these handy attachments. They're tough as nails, simple to use and easy on your pocketbook. Buhler Farm King Y84RR 84" 3 pt. landscape rake, Cat I or II 3 pt. hitch mast, five angle positions, 42 1" X 15" X 5/16" thick steel teeth. Lists @ $1,250. We have two units in stock. Taylor Pittsburgh 233-TM-GN-BX 3 pt. trailer mover with gooseneck hitch ball. Blue color. with 12" semi double-flight auger bit. New Taylor-Way Pittsburgh model 377 7½-foot disk, 7½" blade spacings, adjustable gang angle, 20" solid rear disk blades, 20" notched front blades, seal ball gang bearings. Weighs 935 lbs. We have a blue and a green disk in stock. Used Peterson Built 6' danish tine 3 pt. field cultivator, reversible points. New TAR CRG72 72" compact root grapple bucket, dual independent grapples with cylinder, hoses and flat face couplers, 9" tine spacing between tines, standard cylinder guards. Weighs 487 lbs. Designed for compact tractors under 40 hp. Made in the USA. tines adjustable for 4' up to 6' diameter bales. Faded paint but otherwise in like-new condition. Used set of 42" pallet forks. Came off front of loader tractor. Can be made to fit on 3 pt. hitch or SSL. New Bison NHVH 272 XHD 9' heavy duty 3 pt. 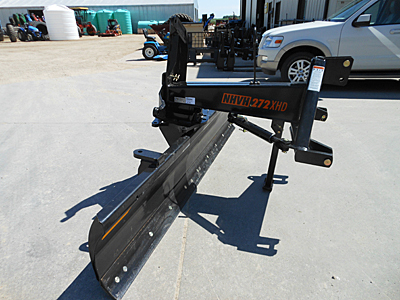 rear blade, Cat II hitch, 18" high, 5/16" thick moldboard, 1/2" X 6" reversible cutting edge. Mechanical linkage for swing/tilt/offset. Optional: hydraulic cylinders for all three functions. For tractors up to 120 hp. Weighs 1,240 lbs. New Buhler Allied 6096 (C8800) 96" 3 pt. blade, 1/2" X 6" reversible cutting edge, optional hydraulic cylinder to angle blade. 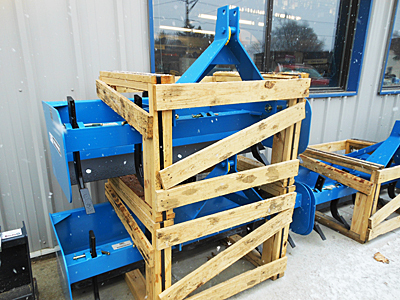 We have three units in stock. New Buhler Allied 6084 (C8801) 84" 3 pt. blade, 1/2" X 6" reversible cutting edge, optional hydraulic cylinder to angle blade. Two units in stock. Used Buhler Allied C8800 8' heavy duty 3 pt. back blade, reversible cutting edge, tie bar angle adjustment. Optional cylinder with hoses can be installed in lieu of tie bar. Used John Deere 65 8' 3 pt. blade, Cat II pins, reversible/replaceable bolt-on cutting edge. Low usage; like-new condition. Used Woods RB7 7' 3 pt. blade, bolt-on reversible cutting edge, low usage. Like new. Walco Renegade 124126 HD6 3 pt. 6' heavy duty box blade with 6" bolt-on reversible cutting edges and five pin-adjust rippers. Red color. Weighs 446 lbs. Taylor Pittsburgh 3 pt. box blades with pin-adjust scarfier teeth, two 6" X 1/2" thick bolt-on cutting edges, Cat I 3 pt. hitch allows usage of Cat I 3 pt. tractor quick hitch. New Holland blue color. We have four units in stock, a 60" unit, a 66" unit, a 72" unit and an 84" unit. Used Taylor Pittsburgh 962GDT-72 72" 3 pt. tiller, 540 slip-clutch PTO, low usage (was traded in on a 96" tiller). New Tar River DLT-050 3 pt. subcompact 50" rotary tiller, 540 slip-clutch PTO, #80 roller chain drive, side shift feature, 4" tilling depth, 7 flanges with 4 blades per flange = total 28 blades. Requires 15 to 25 hp. Weighs 348 lbs. Red color. New Taylor Pittsburgh 923-GDT-48-BT 48" subcompact 3 pt. 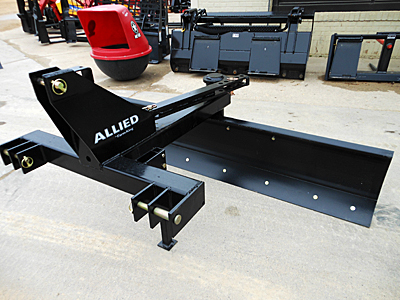 tiller, 540 PTO with slip clutch, weighs 489 lbs., for tractors up to 25 hp. Choice of colors: red, orange, yellow, green & blue. New Taylor Pittsburgh 923-GDT-54-BT 54" subcompact 3 pt. 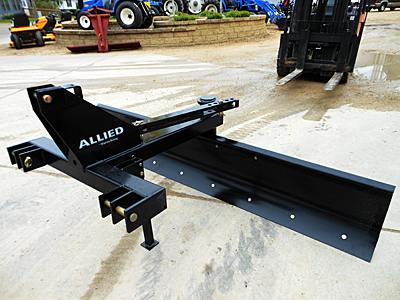 tiller, 540 PTO with slip clutch, weighs 520 lbs., for tractors up to 35 hp. Choice of colors: red, orange, yellow, green & blue. We have two units in stock. choice of colors: red, orange, yellow, green & blue. New USAgear 3 pt. Chipstar PTO 8 wood chipper, 540 PTO drive, 31" rotor with four reversible rotor blades, hydraulic self-feed hopper with variable speed double hydraulic system, discharge rotates 360 degrees, horsepower range 31 minimum hp to 130 maximum hp, weighs 1,000 lbs., new black color, 8" maximum diameter.